Mangos have yellow, green or reddish orange skin and a deep orange interior. The fruit, grown in tropical climates around the world, has been part of the human diet for more than 4,000 years, according to the National Mango Board. 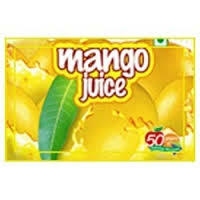 Mango juice contains vitamins and minerals essential for good health. Look for mango juice that does not contain added sugar to get the most health benefits. contains two-thirds of your daily recommended vitamin C requirement. A serving of mango juice supplies one-quarter of the daily recommended beta-carotene intake. The deep orange color of mangos supplies beta-carotene. Your body uses beta-carotene to make vitamin A, which keeps your eyes healthy. Vitamin A and beta-carotene also work in conjunction to promote good skin and skeletal health. about 325 milligrams of potassium. A serving of mango juice, without added water or sugar, contains about 300 milligrams of potassium. Mangos supply a notable amount of iron. Iron produces healthy red blood cells to transport oxygen throughout your body. Adding mangos to your diet can increase your intake of the essential nutrient, if you suffer from an iron deficiency. An 8-ounce glass of mango juice supplies about two percent of your daily iron needs.